The Imperial and Royal Yacht Squadron (k. u. k. Yachtgeschwader) was granted with a special grant thr right for its members to hoist the Naval Ensign as the ensign on the yacht and pleasure boats registered in Austria-Hungary belonging to the members of this elite club. The Squadron was established by naval officers in 1891 and was headquartered in Pula. The membership list from 1903 [Liste, 1903] shows that the Squadron members included numerous Erzherzogs, Princes, Counts and Barons, naval officers and high government officials and high society members from different countries. The five Flaggenofficiere of the association in 1903 were: the Commodore Erzherzog Franz Ferdinand; Vice-Commodore for Austria Alfred Graf Harrach, Vice-Commodore for Hungary Philipp Prinz von Sachsen-Coburg-Gotha; Rear Commodore for Austria Karl Graf Buquoy von Longueval and Rear Commodore for Hungary Geza Graf Andrassy. The annual issue of k.u.k. Marinealmanach for 1914 provides the list of boats registered in Austria-Hungary belonging to the members, mostly sail-boats, but also nine motor boats. The boats were registered in cities on Adriatic coast of Istria and Kvarner, but also on inland lakes of Austria and Hungary as well as in Danube ports. The k.u.k. Yachtgeschwader was re-established at Attersee in Upper Austria in 1991. The k.u.k. Yachtgeschwader is interesting vexillologically since it was granted the right to fly the Kriegsflagge (naval ensign) on the vessels of their members instead of the dual merchant ensign. I know that the k.u.k. Yachtgeschwader members were entitled to use the Austro-Hungarian War Ensign (Kriegsflagge) on their private boats, but the exact scope of this privilege is not completely clear to me. Nearly the last illustration from Znamierowski [zna99] on page 251 shows part of flagchart from "Nachtrag III zum Flaggenbuch" Berlin 1913, showing flags of yacht club officers in Austria-Hungary in 1913. In addition to the naval ensign (erroneously translated "merchant flag") there are nine rank flags, one for the commodore (highest rank in YC), and two sets of four for lower ranks and members' flag, each for either Austria or Hungary. The difference is in the crown and the coat-of-arms used - for Austria the Austrian imperial crown and the black double eagle, and for Hungary the St. Stephen's crown and the Hungarian coat-of-arms. It is my guess that the two sets have been in use regarding the ports of registrations of the vessels, those in Istria, Dalmatia and Austrian held parts of Italy were using Austrian version, while the vessels from Rijeka/Fiume and northern Croatian coast used Hungarian version. I do not know how many such flags were in use, possibly more in Italian parts of the empire (Venice, Trieste) and maybe in Pula - being important military port where certainly was quite a number of high ranking Austrian naval officers living, which were naturally (probably) highest ranking YC officers' too. Regarding Hungarian ensigns, apart from Rijeka, and maybe Kraljevica (Porto Re) I doubt that there was important port that would have YC members. But this whole paragraph is, of course, a speculation. The yachting flags would be flown at main mast or some other convenient place (as jack on smaller boats) according to the highest member present on board, no matter what flag the owner was entitled to (i.e. if owner was entitled to a higher flag and his skipper to a lesser, when the owner is away, the lesser flag would have to be hoisted, I guess). The flag of the commodore is a white swallow-tailed flag with a red cross bearing the Austrian imperial crown in the middle. The flag of the vice-commodore is equal to the flag of commodore, with the middle coat of arms added in canton. For the Hungarian part of the Monarchy the coat of arms of Hungary is set in canton and the cross is fimbriated in green. The flag of the rear commodore is equal to previous pattern, but in place of the coat of arms it have a fouled anchor, also in two variants, one for each part of the Dual Monarchy. The flag of honorary members, founders and first class members is of the same pattern as the flag of vice-commodore, but in shape of a triangular pennant. Of course, in two variants, one for the part under Austrian crown (i.e. Cisleithania) and one for countries of Hungarian crown (i.e. Transleithania). 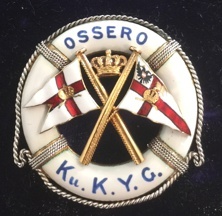 The burgees appears on this 18ct gold brooch which was made for the Archduke Charles Stephen when he commissioned the motor yacht Ossero in 1891. The Archduke was clearly the founding commodore of the IRYS! The motor yacht later changed its name to Delmat and transported Archduke Franz Ferdinand before he was assassinated. The flag of the ordinary members if of equal design as the rear commodore flag, in triangular shape, and again, in two variants for two parts of the country. - Nachtrag III zum Flaggenbuch, Berlin, 1913, as reprinted in Alfred Znamierovski: The World Encyclopedia of Flags, Lorenz Books, New York, 1999, p. 251. - many members were at the same time high military officers - would they have hoisted their k.u.k. Yachtgeschwader flags at military vessels (I think not) and would they have hoisted their military (e.g. admiral's) flags on their/others' private ships when on board (I think quite likely)? - the Navy had several smaller boats and yachts that were used documentedly in the yachting regates and other yacht club festivities. These were commissioned vessels usually used by highest admirals monitoring the races and similar. Would they use military flags (of course, I guess), but would they also have k.u.k. Yachtgeschwader flags hoisted at the time when the admirals were obviously performing the k.u.k. Yachtgeschwader functions? - what about the foreign members owning ships registered abroad. They would have no right to fly the naval ensign on those ships, I am certain, but would they have been entitled to fly the k.u.k. Yachtgeschwader flags (I guess so)? They were usually members of two or more prestigious clubs. Would they use more than one flag, or would they choose one set according to where on Earth they would be? I suppose that there were other privileges of the membership that would encourage someone to join (for a very high fee! ), but the membership flags, but they would be clear indication of such privileges. - regarding the close link of the club with the Navy, would the members be entitled to honorary military ranks (possibly only in ceremonial sense, to wear uniforms at balls etc.)? I think not. - the k.u.k. Yachtgeschwader was divided into two parts, the Austrian and the Hungarian, as the flags clearly indicate. Were the members registered in the two "houses" (for lack of the better name), so they would use the "national" variant of their "house", or was the choice left to the member as he pleases in certain occasion, or was it connected with the port of registration (but then what when the member is guest on somebody else's boat)? The club had ships and boats registered in Pola/Pula and other Istrian cities, probably also in Fiume/Rijeka, but also on inland lakes and rivers, both in Austrian and Hungarian part of the Empire. - it is not clear to me nor to Tomasz whether the yachting flags were used also by the other yacht clubs in the Empire, or whether they had other sets. Such clubs would be Motor-Jachtclub von Österreich and the Kaiserl. Königl. Union-Yacht-Club. As far as I understand, these other clubs must have used the dual merchant ensign, so their yacht could be easily differentiated from the k.u.k. Yachtgeschwader yachts according to this element only. yachts used at regattas in Brioni (I admit I have not read it carefully though, so I do not know how much flag content it has, possibly very minor). However it shows how yachts were navigated in regattas by other members, not the owners, and that would pose the questions above regarding the flagging practice.